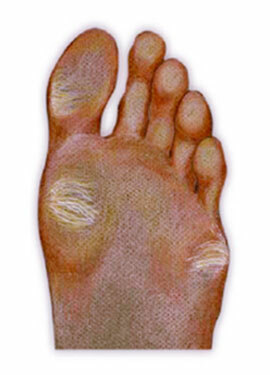 A callus is an area of thickened skin tissue on the bottom of the foot due to irritation. They are localized to high-friction areas, typically under bony prominences. What are the common symptoms/complaints? Patients will complain of pain at the site of the callus. They will feel maximum pain with direct pressure. The integrity of the protective barrier the skin provides the foot is critical in maintaining weightbearing function. Callus formation occurs in areas of high vertical and shear loads and defends against blistering and ulceration. However, this process itself can cause symptoms and predispose patients with poly-neuropathy to deep infection. Even when considering a “healthy” foot, poor foot function can lead to callus formation. During over-pronation, the foot rolls across the metatarsal heads — one at a time — instead of distributing the weight equally. This happens because the foot is a “loose bag of bones” during pronation, causing hypermobility of soft tissues. When the “loose bag of bones” phase goes on too long and the skin is trapped between the bones in the foot and the ground, the friction of individual metatarsal heads bearing all the weight can cause inflammation. The skin thickens in the inflamed area to protect the sore spot. This thick build-up of skin so close to, the nerve endings in the bottom of the foot is what causes the pain. Soft tissue care and maintenance is recommended. However, since the problem is high vertical and shear loading the patient should be fitted with orthotics to properly redistribute plantar pressures. Within weeks, the patient will likely feel pain relief. The calluses can be cut away or will eventually go away on their own once the irritation no longer exists.